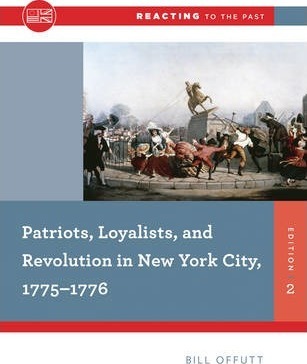 In this Reacting to the Past game, the classroom is transformed into New York City in 1775, where Patriot and Loyalist forces fight for advantage among a divided populace. Confronted with issues like bribery, the loss of privacy, and collapsing economic opportunity along with ideological concerns like natural rights, the philosophical foundations of government, and differing definitions of tyranny, students witness how discontent can lead to outright revolt. William Offutt is Professor of History and Faculty Advisor for the Pforzheimer Honors College at Pace University. He received his AB from Stanford University, and his J.D. from Stanford Law School. Abandoning the law, he then went to graduate school, earning a Ph.D. in Early American History at Johns Hopkins University under Professor Jack P. Greene. His first book, Of Good Laws and Good Men: Law and Society in the Delaware Valley 1680-1710, was published by Illinois University Press. His academic interests focus on the relationship between law and society, particularly the methods by which legal systems obtain and keep their legitimacy. He has taught courses on colonial America, revolutionary America, the Civil War, Constitutional history, and American women's history. In addition to his own Reacting game, he has taught eight other Reacting games to students at Pace, and he has participated in numerous Reacting conferences as Gamemaster and/or player.